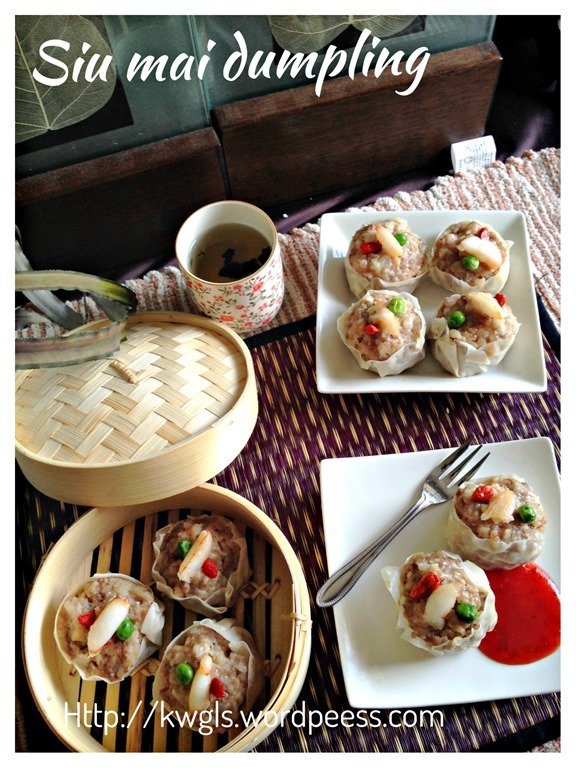 Siu Mai Dumpling （烧卖） and Prawn Dumplings (虾饺）are two of the items that the family never miss ordering when we frequented a Dim Sum restaurant. 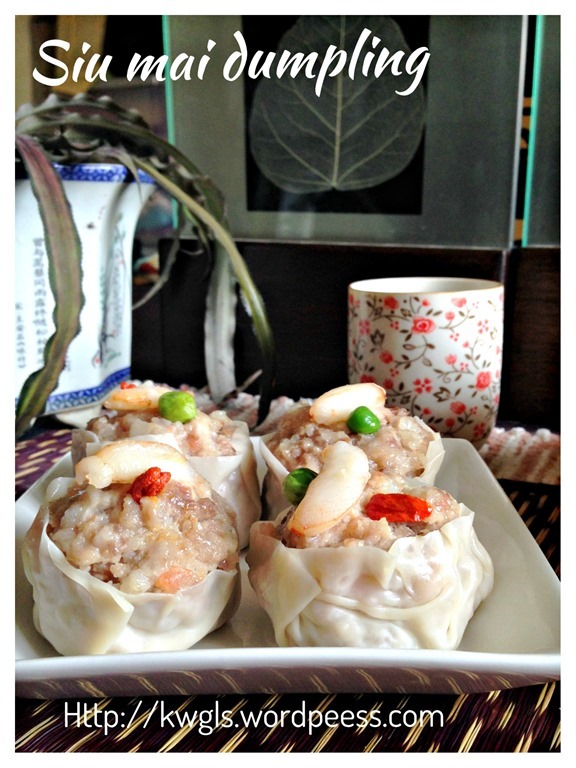 My kids especially my boy love siu mai. 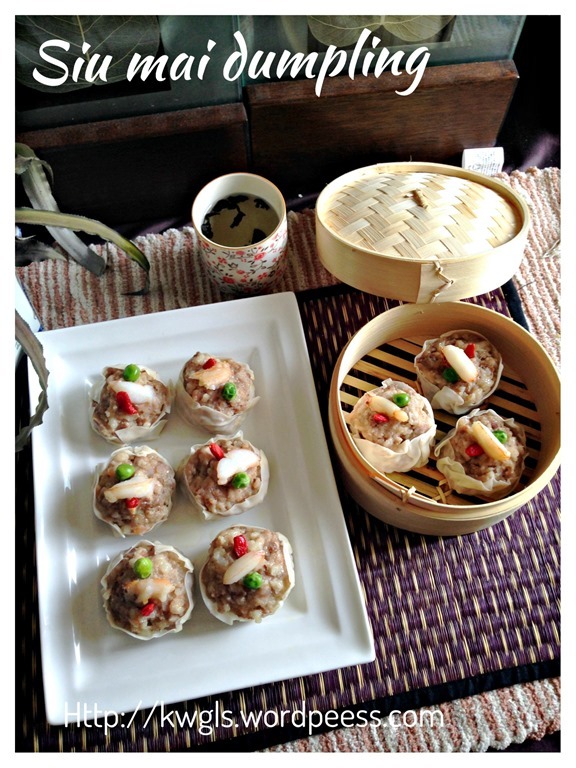 Since I have not prepared siu mai for quite a while, I have decided to prepare today and share with my readers this simple recipe of siu mai. Yes the recipe is simple and most recipe in the net are of almost the same ingredients. 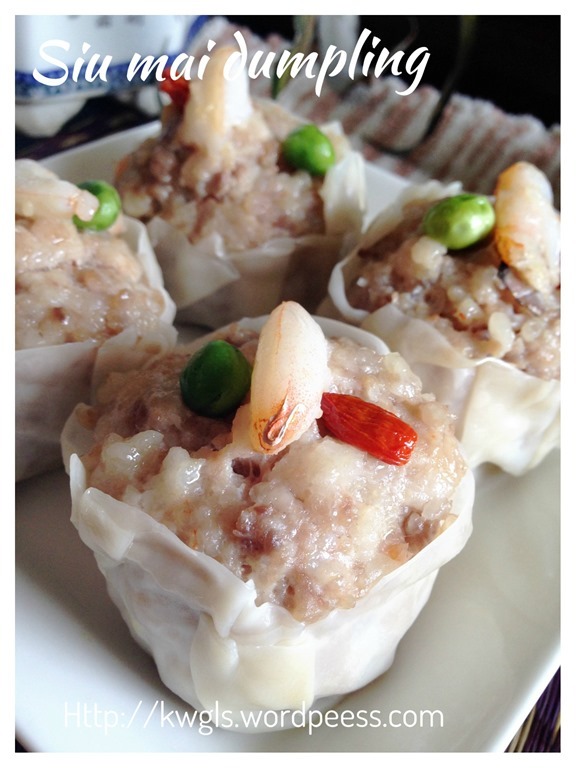 Therefore, taste of the siu mai is rather standard, some springy minced meat full of aroma of minced pork and prawns. I have intended to get some crab roe for the siu mai. I try 2 supermarkets and a wet market, I gave up and decided to use the more economical green peas and wolf berries for the decoration. 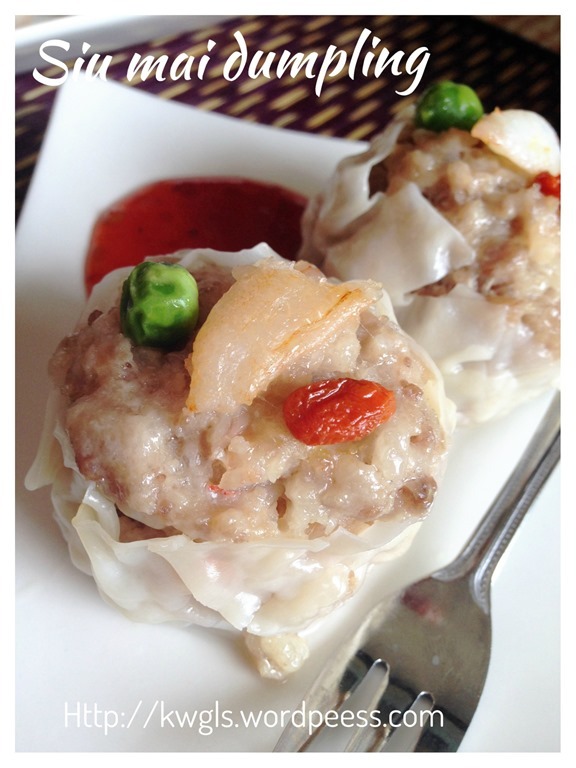 This siu mai was prepared using minced pork, however, you can always used minced chicken if you prefer. 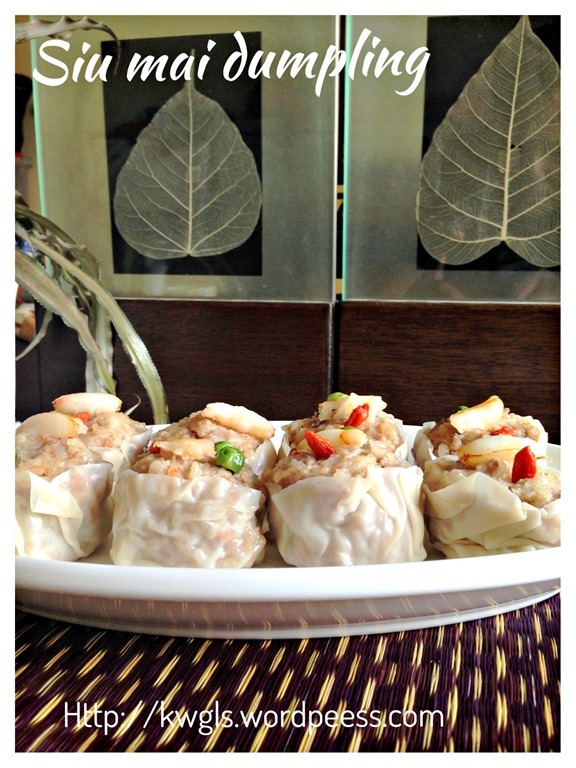 This siu mai is rather big (about 75 grams) each and of course you can prepare a smaller one if you wish. The rationale of preparing this huge siu mai is because it is easier to serve my family and serve my time of preparation. 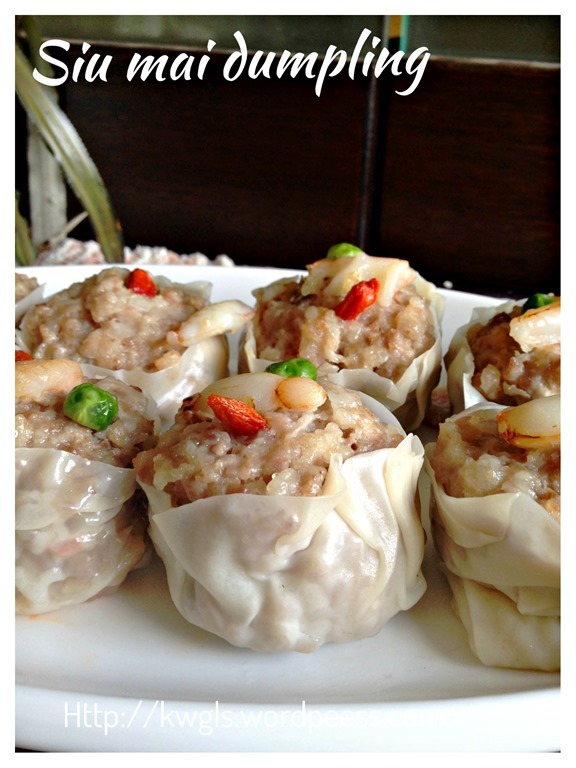 Normal siu mai should weigh about 50 grams. * Note that the minced pork / chicken have to be as fine as possible. You can ask the butcher to mince twice or thrice for you. In this illustration, it is slightly coarse because it was minced once. I can always use a food processor to mince it again but I prefer some coarser meat to bite. 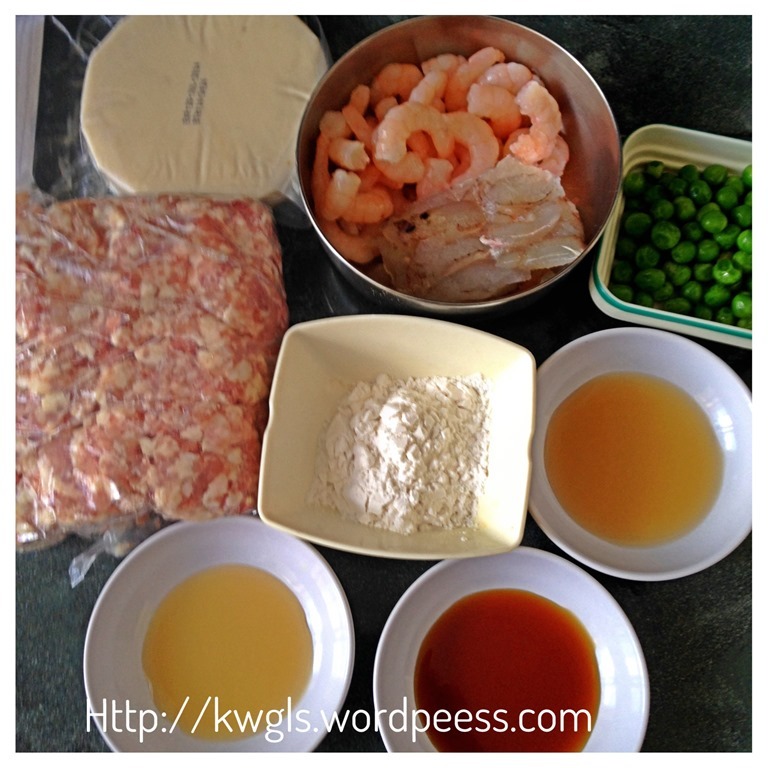 Chopped the fresh prawns coarsely. Note that I have used cooked prawns for this illustration. 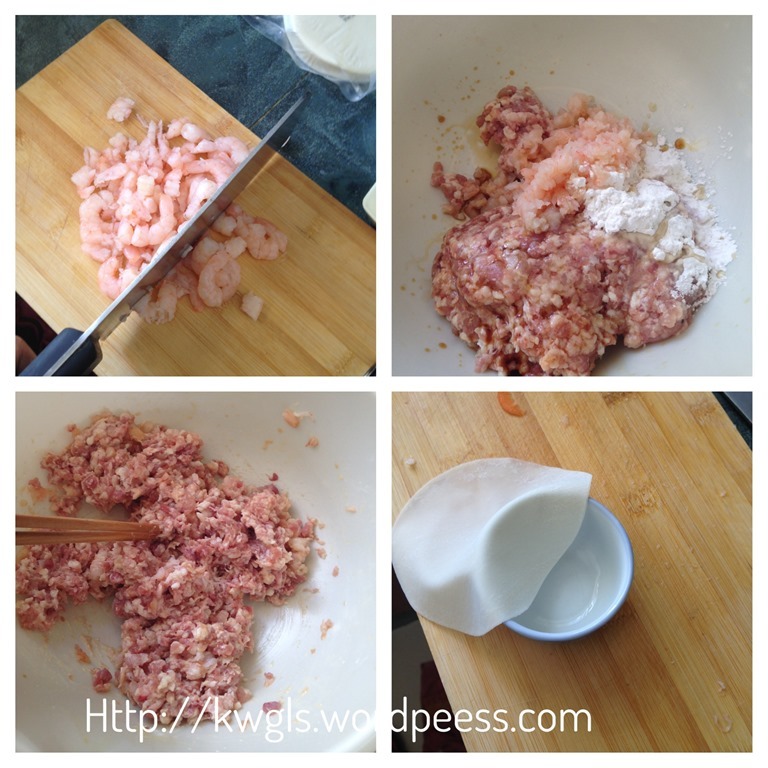 Add to the minced meat. Add all the ingredients except garnishes and wanton skins. Use a chopstick to stir well and marinate for about 1 hour in the refrigerator. Get ready a small Chinese tea cup. Put a piece of wanton skin as centre as possible. Press down to follow the shape of the cup. Fill the cup /wanton skins will the minced meat. 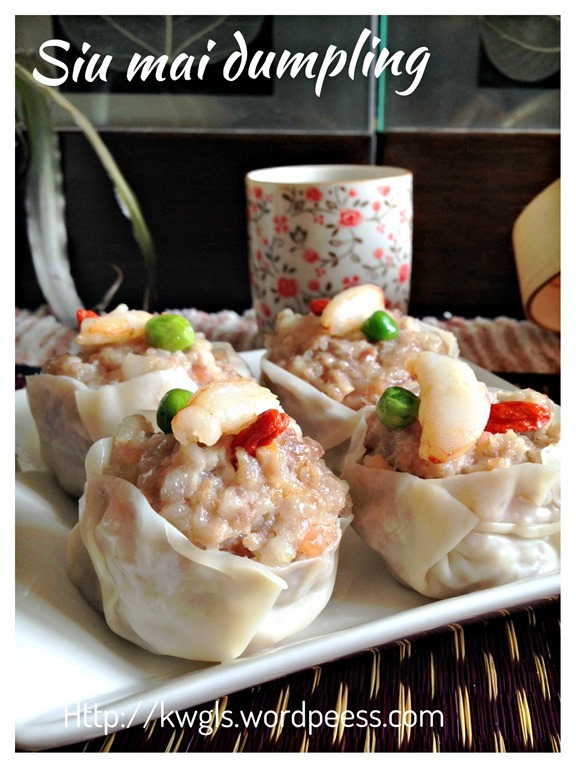 Take out the siu mai from the cup, pat the sides with some water to ensure that the sides stick to each other. Top with the desired garnishes. Transfer to the steamer tray. You can either have some carrot or cabbages or even baking paper in the steamer tray. 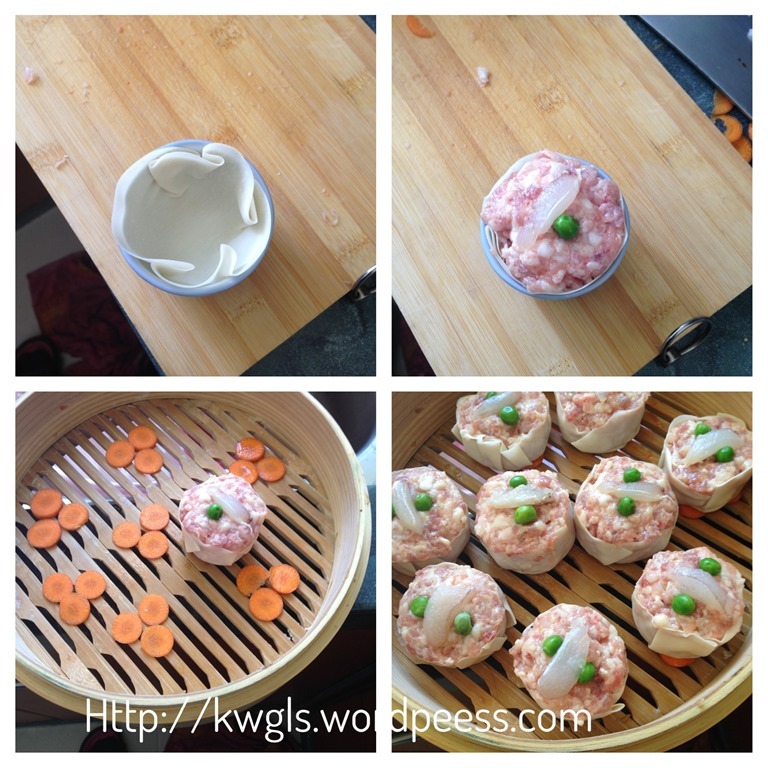 Place the siu mai on top of the carrot/cabbages/baking paper (aim is to prevent it from sticking to the steamer). Note: This is how I do it for this illustration. 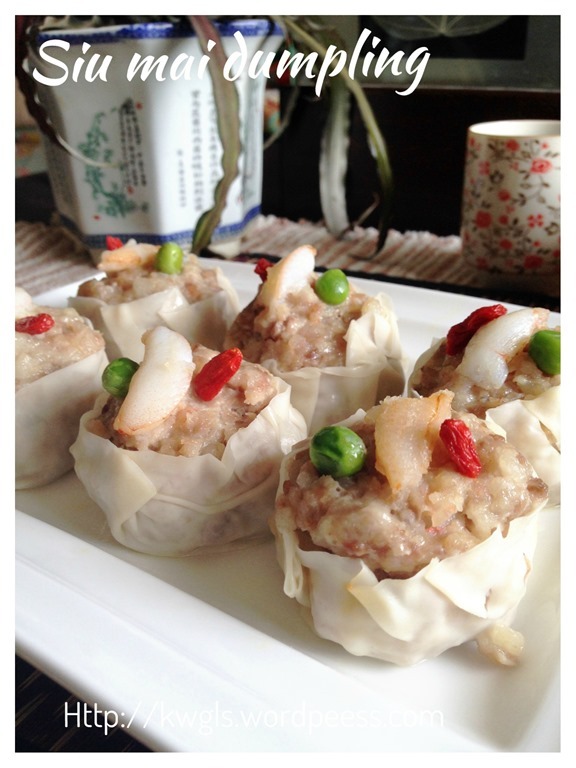 The reason is to ensure consistent sizes of the siu mai prepared. However, you can always just put 1-2 tablespoon of minced meat on top of a flat piece of wanton skin, pull up the edges with the centre expose. Steam in the steamer for 8-10 minutes. Use a skewer to insert into the centre and if it comes out clean, the siu mai is consider as cooked. Best served warm as a snack or a side dish of a family meal. A very simple recipe to share. Nothing to shout about. 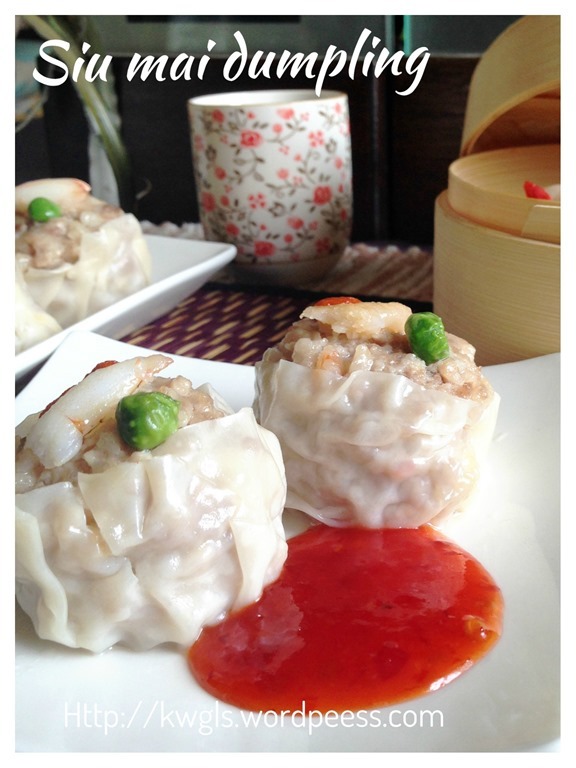 This recipe is rather standard, what actually attract one is the neatness of the siu mai and the garnishes. If you are able to get hold of the crab roe, use it and it will immediately transformed into a classy snack. If you can’t and I have not think about it until now, use salted egg yolk, that is an equally good alternatives. Lastly remember that you can reduce the size to the size that you want. 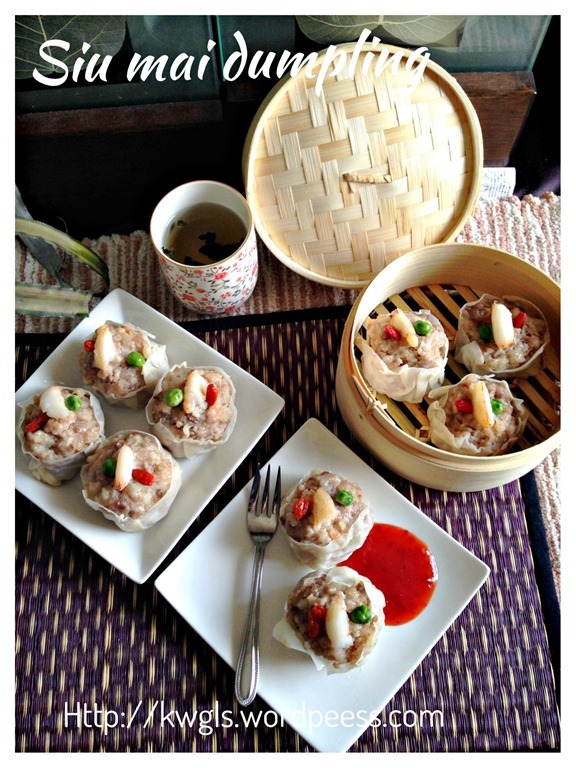 This entry was posted in Chinese and Asian Cakes and Snacks, Food Preparation Series, Meat Dishes and tagged 8, 烧卖， siu mai, dim sum, GUAI SHU SHU, Guaishushu, kenneth goh, pork and prawns dumplings, postaday, shumai, siew mai. Bookmark the permalink.